We offer a variety of childcare services to meet the needs of every family. Before school care is available on all regularly scheduled school days from 6:30am to 9:00am. Breakfast is served daily at 8:15. After school care is available on all regularly scheduled school days from 3:00pm to 6:00pm. A snack is served daily at 3:20. After snack, homework help is provided, as well as time for children to play outside or in the gym. Care on non-school days is available from 7:00am to 6:00pm. Eagle Club will not be open on non-school days if there are less than 6 children registered. Our summer care program is available to all children aged 33 months and older. We keep children engaged and entertained all summer long through weekly themes, activities, and field trips, as well as lots of time spent outside enjoying the nice weather! 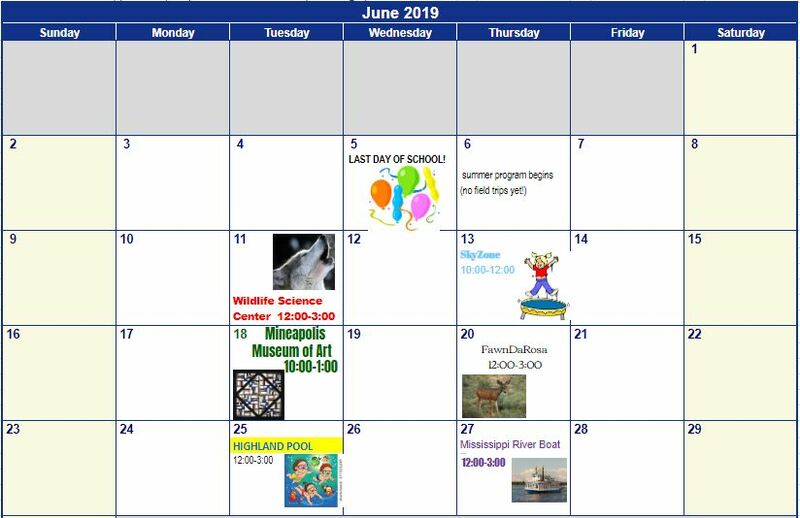 See below for the tentative calendar of June field trips! July and August calendars will be posted as field trips are confirmed.